I had been very busy all week so I arrived in Antrim with no notion of what I was cycling, where I was headed or what to expect! Usually I would read the official website, look at the route and the elevations but time just ran away for this one. 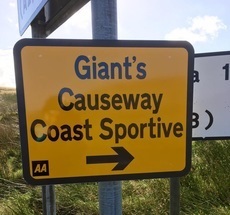 Luckily I rang a friend on the way up who has done the sportive numerous times and she warned me to only to do the 126km route. The 180km would be a big ask especially with Torr head at the end. She kept coming back to Torr head, saying it was tough, it goes up and up some more... to be honest, I have cycled up the Alps so didn't really pay attention. How hard can it be? Have you ever been on a roller coaster? At the start it chugs up almost vertically and your mouth goes dry. Then it drops considerably along with your tummy. That was the first bit. I don't know how I had never heard of this climb until the day before. Even cycling in the Alps I don't remember any of it being this bad. This Torr hell was relentless. 17 kilometers in total. I would climb up a very steep aspect, it would get a bit level and then it would go up again. I don't know. It seemed to go on and on. Parts are 23% gradient, (that's steep!) I honestly thought I would just fall over. My arms and abs were killing me later from pulling so hard on the bike. My front wheel kept lifting off the road in an unprovoked wheelie. The views were lovely though, looking up and up and up at a wall ahead with little tiny cyclists. Thankfully the weather was being kind to us so that was something. I had to dig deep and get up this wall. I found my inner Serena Williams, I was grunting and shouting good-oh, along with some fine sailor swearing and it seemed to help no end! Certainly made the guys around me work a bit harder, they thought I was shouting at them! So the season closed for me on a very steep high. It was tough but I am very glad that I took on the challenge. Another box ticked, another new place visited! Sinéad Kennedy is a Physical Therapist, Yoga Siromani and Pilates Instructor, based in South County Dublin. She treats and teaches people from all walks of life, including many athletes, especially cyclists, runners and golfers. Recently featured in the Irish Independant, FIT Magazine, her Yoga 4 Cyclists class has gained notoriety. 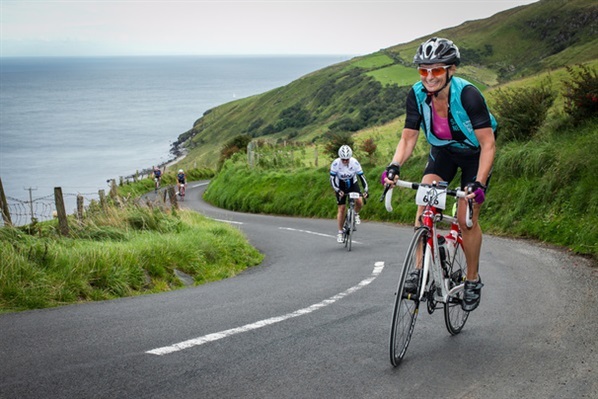 A keen cyclist and proud member of Orwell Wheelers she has completed numerous cycling events including La Marmotte Sportive. Sinéad has also completed three Dublin City Marathons, numerous Adventure Races, Half Marathons and the Camino de Santiago.